Hockey season is fast approaching. It’s time to put last season behind us. So this week hockey is on my mind. The question kicking me today, “Is there any correlation between penalty minutes per game and Stanley Cups?” The data I pulled from the NHL covers 1997-2009. I created a Strength of Team (SOT) component based on the number of playoff appearances weighted by how deep into the playoffs with emphasis given to those in the Cup Finals and Cup winners. On another day I’ll tackle the info that half(!) of the Pacific Division teams are in the top 10…. My thought process – is it the more aggressive teams that dominate or is it the teams who can keep their boys out of the box . . . check this out. I was a little surprised. There is a very strong trend pointing to keeping the boys on the ice. 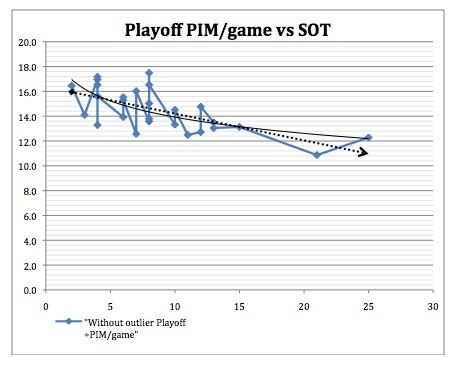 Whether I looked at Regular season PIM/game versus Strength of Team or Playoff PIM/game versus Strength of Team there is a pronounced trend indicating the winningest teams keep their players out of the box. Let me correct that, the teams who win the games that matter most keep their boys out of the box. For the data wonks, I used linear, logarithmic, power and exponential trend lines, all indicated downward trend. I even used some season-over-season moving averages. Log and linear trend lines are on the graph. So coach, keep the boys out of the box. Please!